A small memorial museum at the authentic location where a Berlin brush manufacturer employed blind (and deaf) Jewish workers and tried to protect them from persecution and deportation during the Nazi era. More background info: Otto Weidt was a humble worker who came to "silent glory" as one of the exceptions to the rule of evil in Germany during the Nazi era (a prime example of the sort of "Silent Heroes" that are honoured more generally in another memorial centre next door). It hadn't come out of nowhere in Weidt's case: a convinced pacifist, he evaded World War One, and also took part in the Anarchist workers movement. When in 1940 he opened his small brush manufacturing workshop at 39 Rosenthaler Straße in Berlin, he employed mostly Jewish workers who were visually impaired ("politically correct" term for blind – some were also hearing impaired/deaf). As repression and persecution grew, Weidt made great efforts to protect his employees. As his business traded mainly with the Army, he was able to acquire for his business the status of "special importance" for the war effort, which helped, at least initially. When that wasn't enough any longer and the pressure grew, as the Gestapo rounded up more and more Jews for deportation, Weidt went a step further and began hiding Jews, some in a hideout right here in a back room in this workshop building. He also helped through ID document forgery and even provided active help in escapes from concentration camps. However, despite his efforts, most of his employees were discovered all the same – beginning in early 1943 (i.e. after the Wannsee Conference and the onset of the "Final Solution"). They were rounded up, deported and murdered in the camps, mostly in Auschwitz. Immediately after WWII Weidt continued his good work through a home and an orphanage for Holocaust survivors. He died in December 1947. Much later, in 1971, Otto Weidt was recognized as one of the "Righteous Among the Nations" by Yad Vashem. It took longer for some memorial recognition of Weidt to come into being at the site of his Berlin workshop. In the 1990s a first memorial plaque was put into place at Rosenthalerstraße, but only in 2006 was the present memorial museum opened. Like the 'Silent Heroes' Memorial Center next door, it is run by the German Resistance Memorial Centre Foundation based in Tiergarten. What there is to see: Not too much in the way of artefacts or other classic museum pieces – it's more the authenticity of the rooms themselves that matters here. As you enter the upstairs rooms of the memorial museum, a wing to the left serves as space for temporary exhibitions ... when I visited in January 2010 it was about places where Jews found hideouts in Berlin between 1941 and 1945. The actual museum part is to the right. A computer workstation allows access to more background information. This is also bilingual (German – English). The temporary exhibition at the time of my visit was in German only. Perhaps the most poignant part of the museum doesn't require many words in any case: the original windowless back room that Weidt turned into a hideout for some of "his" Jews. The entrance would have been hidden by a wardrobe. Today a stylized replica wardrobe marks this spot, but the sides are open so that you can actually step into the dark room behind. On balance, this is a small, and topically specialized little memorial museum, but nonetheless an emotionally gripping one. Well worth a look when in the area (and visiting the other two memorial sites in this courtyard – see below). Access and costs: not difficult to get to, free. Details: fairly centrally located and thus not difficult to get to: from the nearest regional metro (S-Bahn) station at Hackescher Markt (between Friedrichstraße and Alexanderplatz, served by the lines S5/7/9/75) it's just a couple of hundred yards' walk north up the lower part of Rosenthaler Straße. Or take the metro line U8 to Weinmeisterstraße and first walk west, then south down Rosenthaler Straße. No. 39 is the brownish, lower, somewhat "shabbier" building (compared to the polished, refurbished neighbouring buildings). 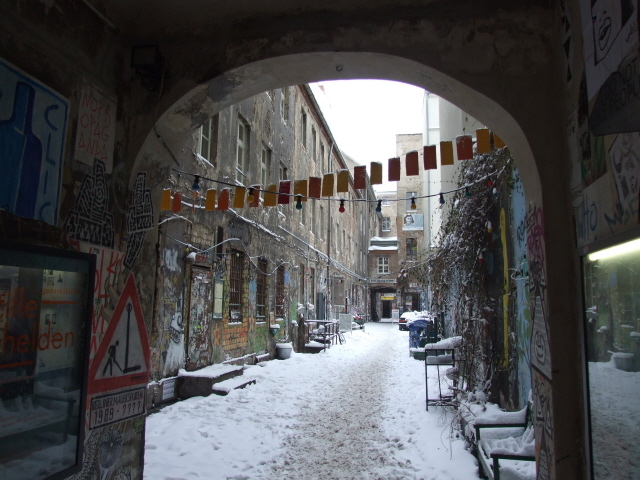 The courtyard is accessed through an archway where there's a Cinema ("Kino Central") and associated café. Walk into the first courtyard (past the "Silent Heroes" Memorial Center) and find the entrance to the Otto Weidt Museum on your left. It's marked with its logo "MBOW" (for its German name 'Museum Blindenwerkstatt Otto Weidt'). Admission free – guided tours are also offered free of charge. Time required: Not long, at best half an hour on average, I would guess. If you can read German and want to study the original documents you may need a little longer – also if you want to make use of the computer workstation. Combinations with other dark destinations: next door, right at the archway that is the entrance to the courtyard at 39 Rosenthaler Straße, the "Silent Heroes" Memorial Center is located – which offers a more general view on cases like Otto Weidt's elsewhere in Germany and the occupied territories, but is well made, though more abstract, lacking the authenticity of location of the Otto Weidt workshop, but is nonetheless a worthwhile, and thematically almost obligatory combination. Also thematically related, though totally displaced from what it primarily commemorates is the Anne Frank Centre of Berlin a bit further into the courtyard on the right. Round the corner on Hamburger Straße (just behind the Hackesche Höfe – see below) is a former Jewish cemetery ... only a few original headstones survived the destructive frenzy of the Nazis though, so today it's more a little park. Here was also a deportation point, from where Weidt was on one earlier occasion able to save some of his Jews from deportation. There's a small memorial sculpture here. For other dark sites further afield see under Berlin in general. Combinations with non-dark destinations: right next door, at No. 40 Rosenthaler Straße, there are the Hackesche Höfe, another set of inner courtyards, but of a very different look to the "alternative" one at No. 39 – no graffiti or wild modern art at the Hackesche Höfe. Here mainstream commercialism rules (see under Silent Heroes Memorial) – the pretty, refurbished, polished tiled facades, however, are worth a look. For mainstream tourism in the city in general see Berlin.